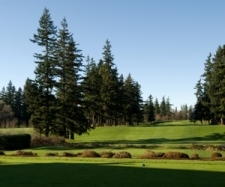 Located between I-5 to the north and Birchwood Avenue to the south, the venerable Bellingham Golf & Country Club is over a century old, and has been the venue for several WSGA and PNGA tournaments as well as USGA qualifying events. The course began life as a nine-holer in 1913, a year after the club had formed and 12 years before John Ball’s original nine was extended to the full 18 holes. Golf was first played in the Bellingham area in the 1890s when enthusiasts would head out into the open pastures surrounding Fort Bellingham, built in 1856 on what is now Bancroft St. This ‘pasture golf’ soon lost its appeal, however, so five holes were built on more suitable land half a mile or so to the east. That land became known as the ‘Golf Grounds’ but it too became inadequate before long. Something needed to be done if Bellingham’s golfers were to have a decent venue at which to practice their strange stick and ball game. In 1911, Everett Deming, the president of Pacific American Fisheries, a salmon packing company headquartered in Bellingham but which also did business in Alaska, went on a business trip to California where he visited a ‘real’ golf course with a ‘real’ clubhouse. This, he thought, was what Bellingham needed. That winter, Deming gathered together his hometown’s most prominent families in order to discuss the possibility of founding a club and building a course. On May 16, 1912, Bellingham Golf and Country Club was officially formed with eleven founding members each of whom paid annual dues of $60 and purchased $100 shares of which there were 74. The original choice for the location of the new golf course was a tract of land south of town, owned by Charles Larrabee, and now called Edgemoor. Unfortunately, an agreement between the club and Larrabee could not be reached because only a short term lease for land was offered; a lease that Larrabee insisted he have the right to cancel on short notice. Never mind; the group’s second choice - 142 acres of forest owned by the Bellingham Bay Improvement Company (BBIC) - was available thanks in part to the fact Glen Hyatt, one of the club’s founding members and shareholders was the President of the BBIC. Hyatt offered the club a very attractive ten-year lease in which it had to pay only the land taxes, and John Ball (see side box) was hired to design and build nine holes for the sum of $3,800. Plans for the clubhouse were drawn by F. S. Piper (one of the founders), but the $7,500 cost of construction was too high, so Piper scaled back his plans. The clubhouse eventually cost $5,000, and the ‘good ladies of the club’ were authorized to spend up to $800 to furnish it. Frank Orchard was hired as the club professional working for $75 a month. His duties included supervising the clearing of trees, the construction of the golf course and clubhouse and instructing members ‘in the proper way to play golf’. Orchard remained the club’s professional until 1920. The nine-holes opened for play in 1913 though it took a while for them to settle. Several sturdy trees had been cut during construction and the stumps dynamited. The stump holes were then filled with dirt, the fairways were plowed and harrowed and new seed planted. Unfortunately, the spring of 1913 was a typically wet one in Bellingham so the new grass was slow to sprout and the stump holes became sink holes. Still, the club charged a nine-hole green fee of 50c. Six years after opening, Deming purchased the 142 acres from the BBIC for $40,000, then immediately sold it to the club on interest-only contract, with the principle due in 20 years. Thanks to Deming’s generosity, the club flourished in the 1920s despite prohibition, a small problem for a club manager willing to take a boat out to the San Juan Islands at night and rendezvous with ‘runners’ from Victoria who packed their boats with plenty of booze which said club manager would store in a locker that only a few people knew existed. Members and their guests could purchase their own bottles from the club steward, who knew the location and had the locker key. In 1921, professional golfers Jock Hutchison and Jim Barnes played a match against Bellingham’s club pro and the club champion Don Randall. No mention of who won is made in the club records but, considering Hutchison, a native of St Andrews who had become a US citizen, won the 1920 PGA Championship and then the Open Championship at St Andrews a few months later, and that Barnes had won the 1921 US Open by nine strokes, it’s a safe bet the visitors prevailed. In 1927, Walter Hagen played an exhibition match at Bellingham GCC, now a full length course following the addition of nine new holes which had opened for play in September 1925. This time of growth and prosperity for the club came to a crashing halt, however, as the Great Depression took hold. Membership numbers declined – to just 137 in 1934 – and the club could no longer afford the interest payments. Some members offered services and goods such as radios, shingles and paint in lieu of cash; offers the club accepted.. The grounds crew’s wages were reduced to 30c an hour, the club steward’s salary reduced to $25.00 per month, and the golf professional’s salary cut to $100 per month. The steward quit, so the golf pro’s wife, took the job of stewardess; a job that came with rent-free accommodation in the top floor of the clubhouse. In 1940, the club installed slot machines to help raise some revenue, but they were not enough to prevent lasting financial hardship. In 1941, shortly after the US joined World War 2, the club decided to close the clubhouse. The locker room, card room, and the course itself remained open, however. At the end of the war, a manager was hired to help bring the club back into the black. He was to be paid from the profits the club made, but as it didn’t make any in 1945, the manager resigned after only a few months on the job. A new manager was hired and paid $200 a month to find money from somewhere. He managed to enable the club to meet its expenses but it still wasn’t in a position to pay the interest on the land purchase. Deming had been lenient but after his death in 1942, creditors had begun demanding payment. The outstanding unpaid interest and principle had grown to over $88,000, but the club’s president, McKinley (Mac) Ellis, who was also president of the Bellingham National Bank, negotiated with the creditors to get the debt reduced to $73,000 which the club could pay off in ten years. That gave the club some breathing room and the time to increase membership to a sustaining level. Before that period ended, the membership climbed and the club floated a Capital Program in which the members bought a share of stock in the club for $200. That raised the necessary cash to pay off the debtors and put the club on sound financial footing. In 1948, after winning the Tacoma Invitational, eight-time Tour winner Ed “Porky” Oliver visited BGCC to play an exhibition match. He liked the course so much, he made it a regular stop when visiting the Northwest. Two years after Oliver’s visit, a 20-year-old Stanford undergraduate named Gene Littler played at BGCC in one of the many NCAA tournaments the club hosted. Carol Mann, a winner of 38 LPGA events including two major championships, played an exhibition match at the club some time in the 1960s, and in 1979 Bob Hope played at BGCC after having played in Spokane and Seattle already that day. It is said that, despite playing three rounds of golf and performing on stage at the Mt Baker Theater in the evening, Hope still found the energy to close one or two of the town’s bars. Two years ago, Hall of Fame golfer, Billy Casper who won 51 PGA tournaments including three majors, gave a clinic at Bellingham GCC to help raise funds for the NW Indian College. Typical of the Northwest, this beautiful course’s fairways are lined with fir trees that put an emphasis on accuracy and sensible shot-making rather than length. The player who lashes at the ball as hard as he possibly can but with little thought as to where he should position it will drop more strokes than he could possibly hope to make up. The greens, like those on so many old, established and well-trodden courses, can be devilishly quick and possess countless subtle breaks you don’t know are there until your putt snakes off-line. The club celebrated its centenary in August of 2012 (yes, 100 years and a couple of months old!) with a weekend of special events.